Back to school means back to packing lunches. If you’re like me, I pack lunches everyday! Not only does it save money but it also gives me the ease of mind that my daughter is eating her lunch! Packing lunch can be repetitive and can really begin feeling like a chore. Getting creative with your child’s lunchboxes can keep it fun for both you and your children. Keeping a balanced diet isn’t as hard as you may think! 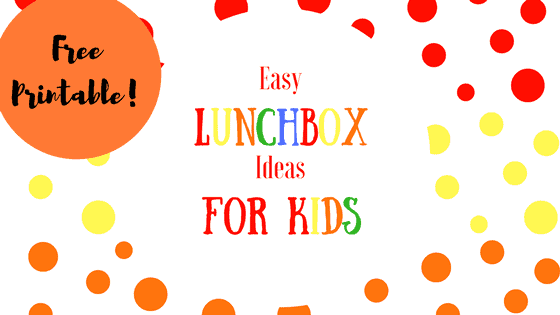 That’s why I compiled this list of easy lunchbox ideas for kids! Keep scrolling to the bottom for a FREE printable for easy lunches! Check out this FREE Printable for ideas for lunches your kids are sure to eat! Who knew a lunch could be so cute! I never thought about cupcake liners as a snack holder! I am sure many mommas will be grateful too. This comes at a perfect time w back to school round the corner! Pinned this for later! I love the kabobs idea, so different! These are such great ideas! And the Printable is very helpful! Thanks for sharing these awesome ideas! This is awesome. Though I homeschool, I’ve been still packing lunches some days for when we do field trips or run errands. It just makes it easier. This list is so helpful. These are such great ideas. Thankyou for th inspiration ? Love these ideas! It can be so hard to come up with new lunch ideas all the time. I love the ham and cheese kabob – so cute! If only my children would eat these wonderful ideas. My daughter is in grade 3 at school and has had the same lunch every day for the last 4 years ? She just won’t eat anything else!